Was Baron Georges Eugène Haussmann (1809-1891) the founding father of engineering resilience? Architecture is facing a dilemma: urban buildings are aimed to last. Our society celebrates “architects-stars” who leave their marks in the urban grid. The cultural legacy of “historical” cities strengthens the sociological link between buildings, duration and property. In such a context, M. Laboy and D. Fannon expressed a critical view on the way architectural resilience is approached in the US. They underline the limits of the so-called “engineering resilience”, not elucidating the fundamental implications of design for variability, uncertainty, and risk” (1). Though perfectly understandable, this point of view should not hinder to investigate the physical properties enabling materials to improve building’s resilience. And interestingly enough, this does not exclude the choices that have been made during the 19th century. Who would dare to say that Paris architecture is (today) resilient? Probably no one, though 60 % of the Parisian grid is of the renowned Haussmann style, a far better example of resilience compared to other contemporary buildings. Originally conceived for different usages, with high ceilings, flexible and shared walls in dressed limestone and with mezzanine connected to the ground floor, the Haussmannian buildings show their ability to adapt to the developments of the city (2). The way ground floors adjusted to different types of businesses since the erection of the buildings, more than a century ago, speaks for itself. Isn’t it a good example of a potential ability for a state of balance to adapt to socio-economic hazards? On top of this subjective assumption, the Haussmannian buildings show a natural resistance to temperature variations, limiting the usage of heating and/or air conditioning, improving the sustainability of the frame. Examples of resilient architecture are not very common in European structured and organized cities. Still, as recalled by A. Caimi (3), resilience can be developed in a large number of countries where buildings have been erected without the contribution of an architect. In Japan, both vernacular and contemporary buildings make use of materials that take into account the earthquake risks (4).More exciting: the research on new products and new technologies open doors to applications that can hardly be grasped by the average citizen. Revolutionary materials are currently developed to mimic biological nanotubes leading the way to a range of potentially resilient novel functionalities (5). Prototypes of smart structures are designed, inspired by the instinctive behavior of animals, to create facades that can adapt their structure according to weather conditions and possibly to seismic motions (6). No one really knows when those laboratories ideas and experiments will improve our well-being. 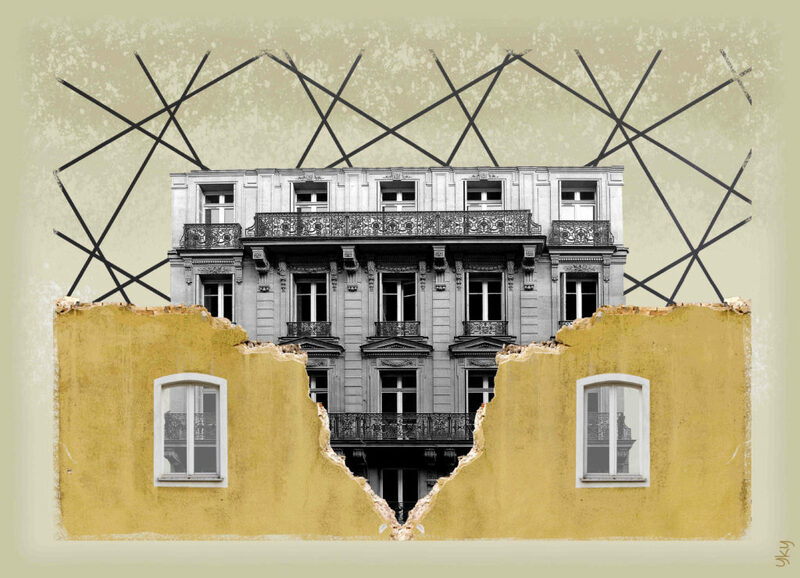 In the meantime, let’s enjoy the old fashioned Baron Haussmann style, its ability to address a large scope of issues as above described and ask engineering experts a provocative question: Is such resilient architecture still achievable?